You can buy bonds with yields as high as 20 percent. 3. What Is Pushing a Bond Yield Higher? Several different types of mutual funds have either an annual interest rate or an annual percentage yield, both of them calculated daily. You can buy money market funds that are either taxable or tax exempt. 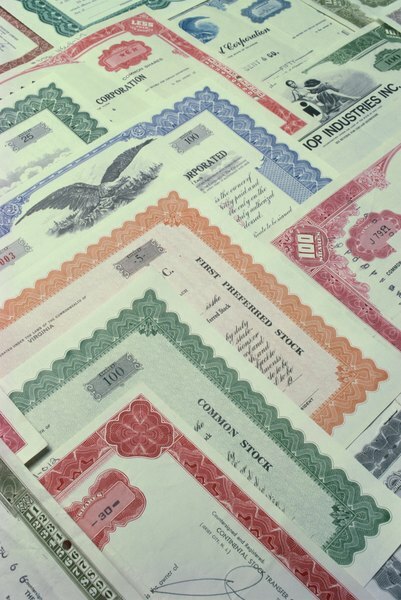 You can also buy high-yield bond funds that have had annual returns of nearly 20 percent and short-term government bond funds, both taxable and nontaxable, with yields of less than one percent. Some long-term government bond funds had negative returns through the first few months of 2018. In all cases, the interest rates and yields available are commensurate with associated risk. The specific type of mutual fund you are invested in will determine the amount of interest you earn. Generally speaking, interest rates and yields are directly proportional to investor risk. Money market funds come in two flavors. The first is the money market account, or MMA, offered by a financial institution insured by the Federal Deposit Insurance Corporation and more formally known as a money market deposit account. The second is the money market mutual fund, like many investors have in a brokerage account. Both fund types are subject to federal income tax. On May 17, 2018, 10 money market mutual funds listed by Bankrate averaged a little more than 1.76 percent annual interest. The fund with the highest interest rate paid 2.01 percent annually. You can also buy tax-exempt money market mutual funds. While taxable money market mutual funds invest in Treasury bills with maturities of 90 days or less, tax-exempt money market mutual funds normally invest in municipal money market securities that are exempt from federal taxation and have maturities of two years or less. As of Feb. 28, 2018, Morningstar reported that the highest return from a high-yield municipal money market fund for the prior year was 4.93 percent. The category average reported by Morningstar was 4.54 percent over the same time period. Bond funds – mutual funds investing exclusively in government or corporate bonds – have a wider range of returns than money market funds. The returns depend upon the average maturity of the bonds held in the fund and also on the relative risk of the fund's holdings. At the upper end of return rates are high-yield bond funds that invest in lower-quality corporate bonds, many of them unrated by any of the major bond-rating agencies, such as Standard & Poor's, and often referred to as "junk bonds." Each of the underlying bonds in the fund has its own interest rate, but the fund's yield may be higher or lower than the weighted average of the bonds' interest rates. Bonds in high-yield funds, for example, usually trade at a discount to the offering price, with yields therefore higher than nominal interest rates. The average one-year return for 10 high-yield bond funds in a "U.S. News and World Report" list of recommended funds is a little more than 7.5 percent. The highest-yielding fund had a one-year performance of 8.93 percent. Funds holding long-term Treasuries are more volatile than those holding short-term Treasuries. For the one-year period ending May 21, 2018, long-term government bond funds lost 3.09 percent on average, while short-term government bond funds lost just 0.51 percent on average. Tax-exempt bond fund returns over the same period ranged from a loss of 0.06 percent to a gain of 3.47 percent on average, depending on the category of bond. What Is an Inverse Bond?